Brandie Dalton of Multi/Tech Engineering explains something about the apartment plans. A proposed 48-unit apartment complex in North Albany, the first in that part of the city, has neighbors concerned about its effects on traffic, privacy, and the value of their homes. 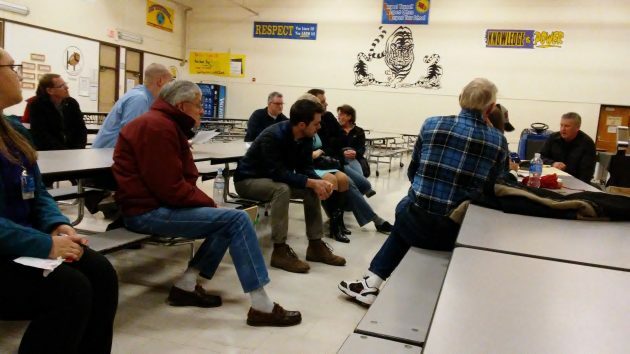 About 25 nearby property owners and residents turned up for a community meeting Wednesday night at North Albany Middle School. 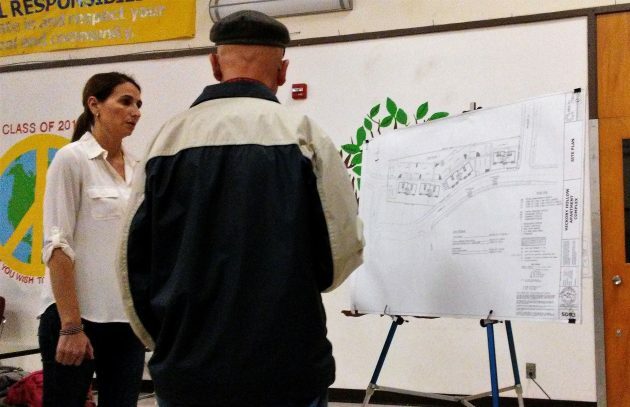 Two representatives of Multi/Tech Engineering Services of Salem had called the meeting to explain a Salem developer’s plans for the 2.25-acre site at 720 Hickory St. N.W. They said the name of the developer would become public when a site plan is filed with the Albany planning division. The developer is buying the property from the Olympia, Wash., family that owns it. Approving the site plan will be up to the planning staff. The site is split between two zones and, according to the city, apartments are allowed outright in both. The name of the project is “Hickory Hollow.” The layout calls for four three-story buildings containing 48 units and 94 parking spaces, along with two access points off Hickory, landscaped grounds, and two open spaces designated as play areas. There would be 12 one-bedroom apartments, 24 with two bedrooms each, and 12 with three bedrooms. Rents would be based on the market and would not be subsidized. It would not be low-income housing. Fences would separate the parcel from neighboring residences. A manager’s office would be on site. The neighbors’ concerns were many and varied: More traffic on Hickory Street and North Albany Road, which they consider inadequate to handle it; more vehicles parked on the street; second stories overlooking adjacent single-family houses; a decline in the neighborhood’s quality of life and home values; the safety of children walking to nearby elementary and middle schools; and indeed the capacity of schools to hold more children. Some criticized city street planning for the area as inadequate, and they called for a traffic impact study. Another case of NIMBY. People gotta live somewhere. You didn’t buy exclusive rights to keep all the property in your neighborhood undeveloped. Grit your teeth, bite your tongue, and face the inevitable. North Albany took a collective sigh of relief when Hasso revealed the new apartments will “not be low income housing.” PHEW! Many in North Albany are refugees-of-sorts, having fled the inner-city carnage common to older parts of Albany. The river barrier and stiff property taxes have, until now, prevented the ghettoization of North Albany. Based on Hasso’s reportage, there may be a small number of the slightly less fortunate moving to North Albany (a non-sanctuary city) to rent one of the new apartments. The rumor mill is now churning, suggesting that KING KONE, the dining emporium over in Old Albany on on Salem Avenue, wants to open a second restaurant near where the Hickory Street apartments are going up. Should be interesting. True. This isn’t a developer issue. It’s a city planner issue. How are the schools supposed to deal with the influx? How are residents supposed to handle the increase in traffic? I get that the planners see dollar signs in their sleep but first things first! Get the infrastructure ready first. “… beautiful, yet safe and quiet place …” Really? Half a block from a major intersection, soon-to-be-major shopping, hundreds of parked cars, adjacent to the only entrance for at least 70 large multi-car houses, 800 feet from Hwy. 20. That area is already ruined. I’m amazed how anyone can see young people (assuming they’re the ones to actually rent the apartments) as a greater threat to livability and property values than the massive asphalt jungle so close. I’m 71 and live in an apartment 2-3 miles from OSU: all ages, mostly young, maybe a little over half students, some bicycle riders like me, usually peaceful and quiet except for those parts subjected to busy-street noise. Here in Corvallis, the problematic student-housing area seems to be much closer to OSU. The point to all this is that I can’t imagine OSU (or even LBCC) students traveling all the way to North Albany (especially by bike) to raise a ruckus. By the way, unless my geography is wrong, the Bonaventure is more south than west of the proposed apartments.